You hear about road rage on the news. People are losing control over themselves to prove a point. Unfortunately, this road rage, also known as snow rage in the winter, leads to car accidents and death. For example, in Pennsylvania, a nearly 30-year-old man shot and killed an 18-year old young woman because she wouldn’t let him cut in front of her. Frayed nerves and tempers on edge come into play during a significant snow event—especially if the snowstorm hits during rush hour. There are more cars on the road, people trying to get to work or home from work. Plus, school buses are trying to get everyone home in one piece. And then, there’s a snow plow in the way—going slow. So, an impatient driver will try to pass the “slow poke” only to give the plow driver the one-finger salute or obnoxiously honking his horn. 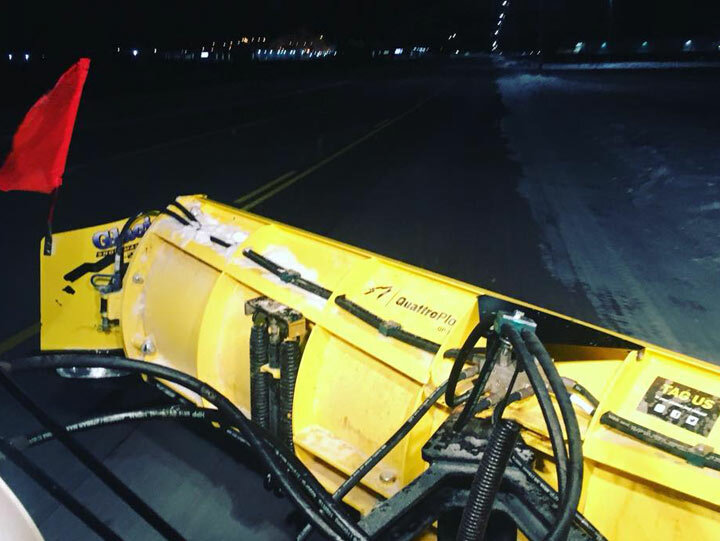 The New Jersey Municipal Self Insurer Joint Insurance Fund has a PowerPoint called, “Snow Removal Safety.” In it, the company shares different points that should be a part of every snow and ice management company policy. When a new driver is plowing snow, he or she is focusing on getting the job done right without hitting any obstacles that may be in the way. All of a sudden, a honking horn or a tailgater or worse is distracting the snowplow driver. Dangerous weather conditions and being new on the job are already stressors. Adding an impatient driver to the mix only compounds the stress. We all deal with stress differently. For some, anxiety and fear comes out as anger—sometimes as a volcanic temper. So, the new snow plow driver needs to know what to do when there’s pressure coming from the public. Does he fight or flight? As a snow plowing company owner, you need to write down tips and expectations, dealing with the public in hazardous weather conditions. Whenever possible, new drivers should be required to have a more experienced driver sit with him or her for a set amount of time. The more experienced driver can give advice dealing with the impatient car drivers on the road—all without resorting to a dangerous snow rage incident. Read this Pack Leader Profile with Seasonal Property Services. There are ways to deal with stress and anger behind the wheel without starting a fist fight or threatening the aggressor with a baseball bat or worse. Make sure your trucks have their rear lights on: Remind your drivers to turn on their rear lights, so cars on the road know that a plow truck is up ahead of them. Most drivers should slow down and exercise more caution. Make sure you’re well-rested before starting your shift: If you know a storm is coming or you know what time you need to be in for your shift, make sure you get enough sleep and eat healthily. When you take care of yourself, you have more energy to deal with reactive drivers. Don’t react: It’s human nature to want to give as good as you got, but you need to learn new ways of dealing with your anger. Count to 10, slowly breathe in and out, get a stress ball to squeeze, or any other way to release that tension without reacting to the aggressive driver. Stay calm: Just like you shouldn’t react, you need to stay calm and alert to the hazards of the road. Find easy solutions for keeping your cool. Watch the direction of your plow: Make sure your plow is aimed to avoid throwing snow in the driver’s lane. Know your route: The more you know, the more you can be in control of your emotions. If you know your route to clean roads, you’ll feel less aggravated at an aggressive driver. Be aware of the weather: Keeping your eyes on the road is a priority. So is understanding the weather conditions. If there’s blowing snow and icy roads, you should stay razor focused on the weather and any obstacles. In other words, ignore crazy, angry drivers. salt dependency while increasing your plowing efficiency. If it’s possible, clean off lots and roads during low traffic hours: Sometimes snowstorms will start during rush hour traffic. There’s nothing you can do about that except doing a lot of deep breathing exercises. However, if you can wait to work on the road or a parking lot, do so to avoid dealing with hostile drivers. Hire a behavioral health coach to give tips on dealing with anger and reducing snow rage incidents: Depending on where you have your snow and ice removal company, it may be a smart idea to bring someone in who’s trained in anger management. It’s not a sign of weakness. Instead, it’s protecting your bottom line. If one of your drivers engage in a shouting match or a fist fight over dangerous conditions, your insurance premiums go up, and you may be sued or have to go to court. Make sure your drivers are well-trained and understand the scope of their job: Knowledge is power. The more your drivers feel confident behind the wheel, the less they’ll react to the pesky public. However, some folks are more impulsive and have a hot temper. And they need to get that under control before going out in the next storm to do battle with Mother Nature and aggressive drivers. At SnowWolf, we engineer the best plows for your dollar. Our plows are built with the latest in technology to make cleaning parking lots, roads and other hard surfaces a cinch. Not only do you get the cleanest scrape each time you plow, but you also get the job done faster. Even your newest drivers can expertly maneuver our plows to get the job done quicker and cleaner. We have a wide variety of plows to fit different snow pushing machines, such as autowing plows and snow plows. Contact your local SnowWolf dealer or contact us at 1-800-905-2265. You can fill out our contact form, and one of our representatives will call or email you.